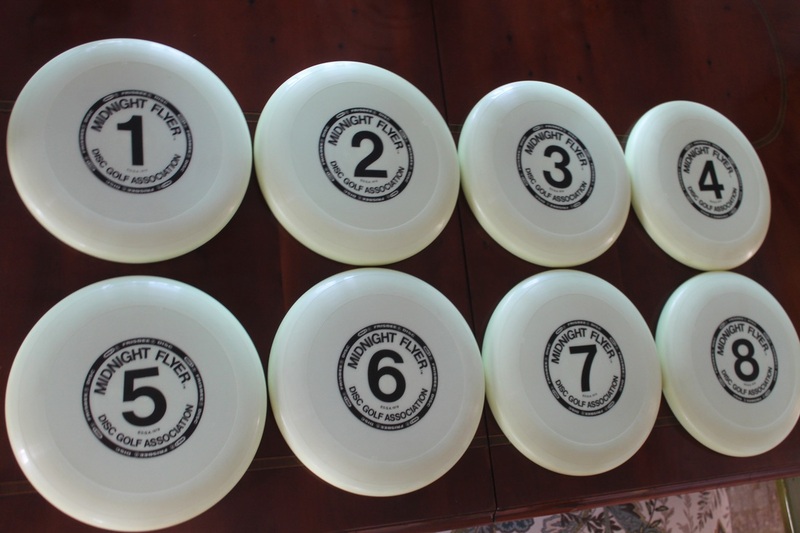 Wham-o Fastback the # 6 is a FB 6, the # 7 is a FB 19 and the # 8 is a FB 20, Disc Golf Association Hot Stamp, note the 2 types of Trademark Bands. Value $75 each. Wham-o 100 D mold, Disc Golf Association Hot Stamp with a slotted Trademark Band. Value $75 each. Wham-o 100 mold, Disc Golf Association Hot Stamp with a Trademark Band. Value $75 each. Wham-o 100 mold, Disc Golf Association Hot Stamp. # 2 has some ink & seen some action, value $ 30, all others are new, $75 each. Wham-o 100 mold, found a # 8 to go with the above discs! Value $75. 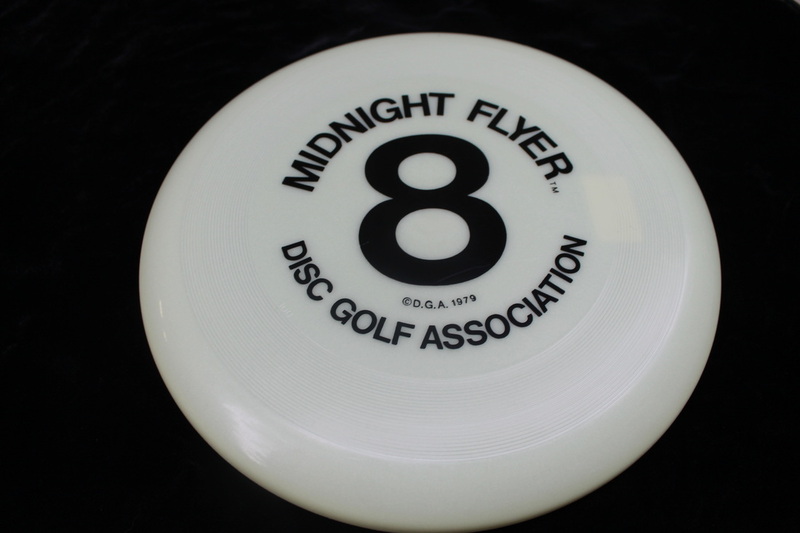 Wham-o 80 E mold, Disc Golf Association Logo with a slotted Trademark Band. Value $75. 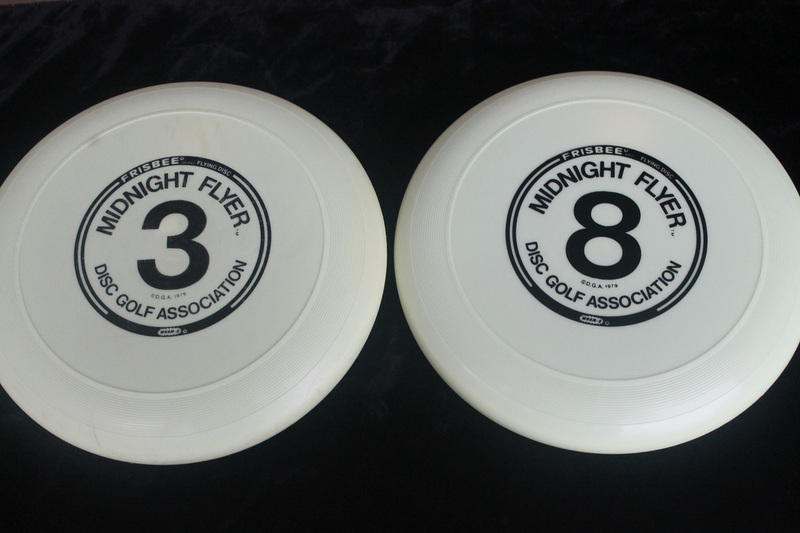 Wham-o 80 C mold, Disc Golf Association Hot Stamp, Slotted Trademark Band. Value $75 each. 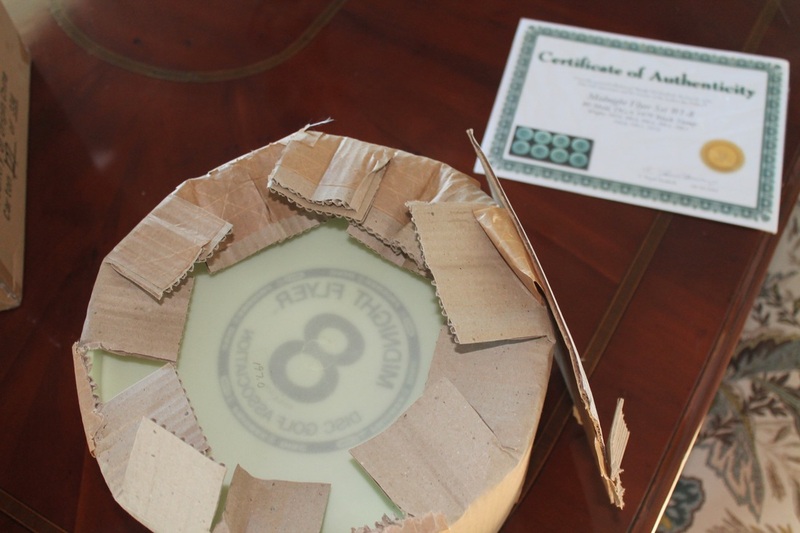 Wham-o 80 mold, Disc Golf Association Hot Stamp with a Trademark Band. Value $75 each. My new 80 Mold set! 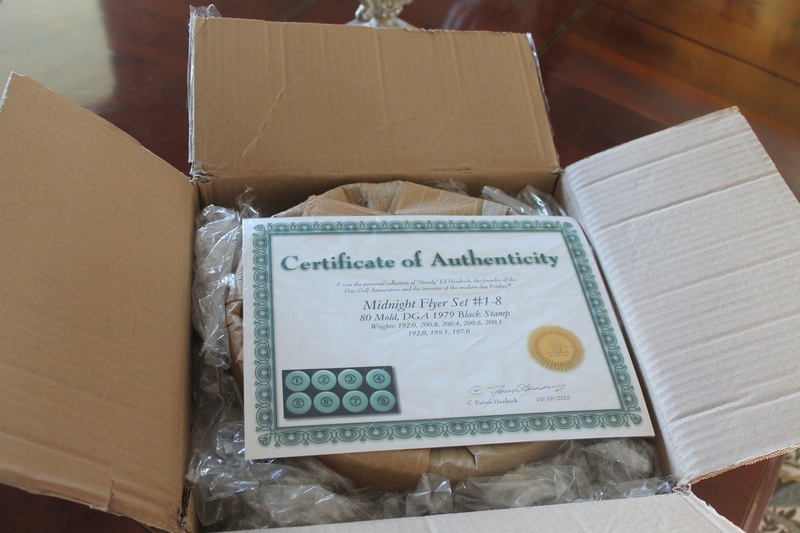 this is original packaging, they have some scuffing so into bags after these pictures! 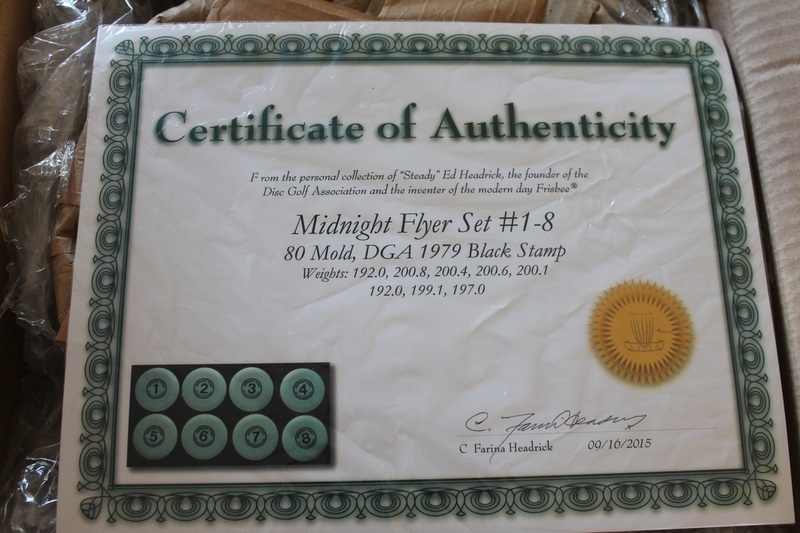 80 mold set! Value $900. 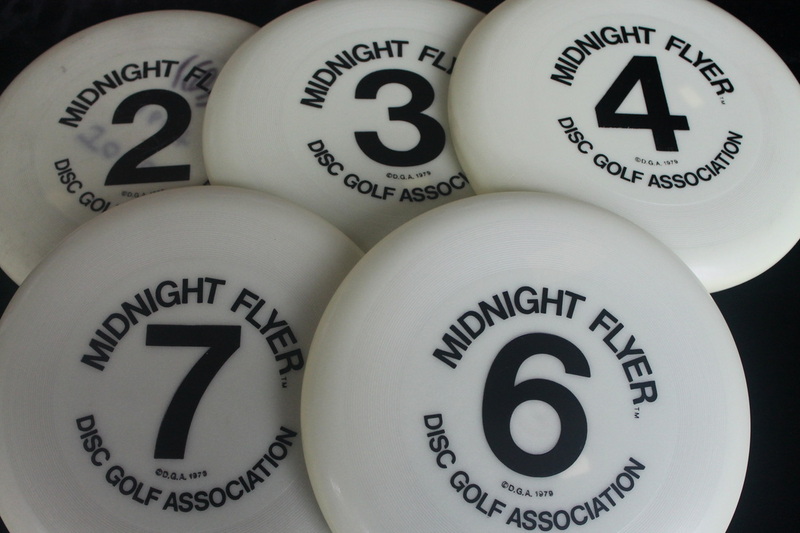 Wham-o 71 C mold , Disc Golf Association Hot Stamp, slotted with a player line, this is the only Midnight Flyer that I have with the addition of the DGA Approved in the hot stamp. Value $75. 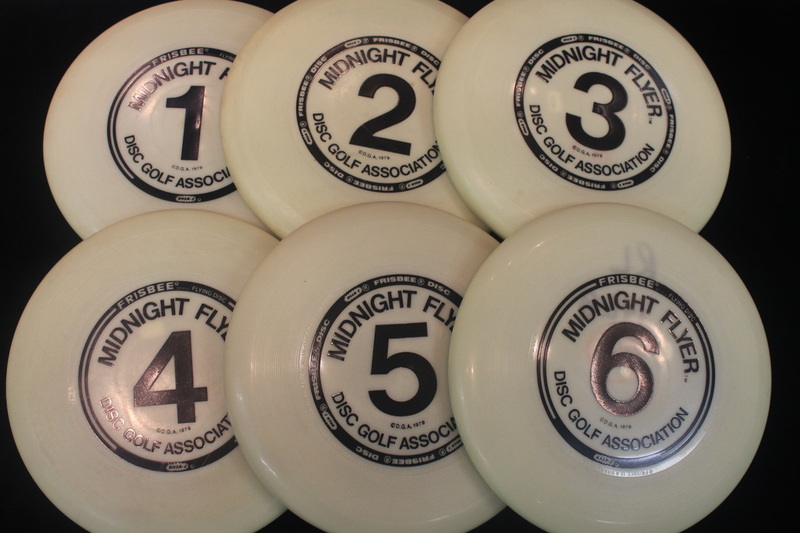 Wham-o 71 C mold, Disc Golf Association Hot Stamp, slotted with a player line. 71c mold new like the day they were stamped! Value $850. side look of the package of the 71c above, this was how it was packed by DGA back in the day. Wham-o 70 c mold, Disc Golf Association Hot Stamp, slotted Trademark Band. Some with player lines some without, some thrown some new, value $35-$75. This is my new 70c set! My plan is to sell the discs above this picture, the cello like a set but are 2 different runs or at least stamps one from 1979 & one from 1981, the 81 stamp has the player lines. Wham-o 70 c mold, Disc Golf Association Hot Stamp, slotted Trademark Band. Value $75 each. 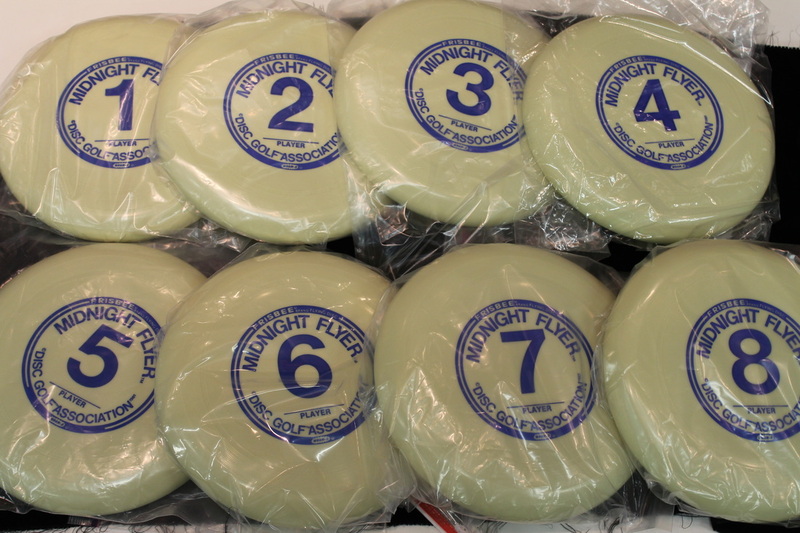 Wham-o 50 G mold, Disc Golf Association Hot Stamp, slotted Trademark Band, player line, just need a # 4! Value $75 each. Wham-o 70c mold, Disc Golf Association Hot Stamp, Slotted Trademark Band, player line. Matching set but all but the $6 are used, value from $30-$75 each. Wham-o 50 G mold, Disc Golf Association Hot Stamp, slotted Trademark Band. Seen some action one with ink, Excellent condition, value $50 each. Wham-o 50 E mold, Disc Golf Association Hot Stamp, slotted Trademark Band, Player line. un thrown set. Value $700. Wham-o 50 mold, Disc Golf Association Hot Stamp, solid Trademark Band. Value $75 each. Wham-o 50 mold, Disc Golf Association Hot Stamp. Old school peeps like them without the trademark band, value $750. 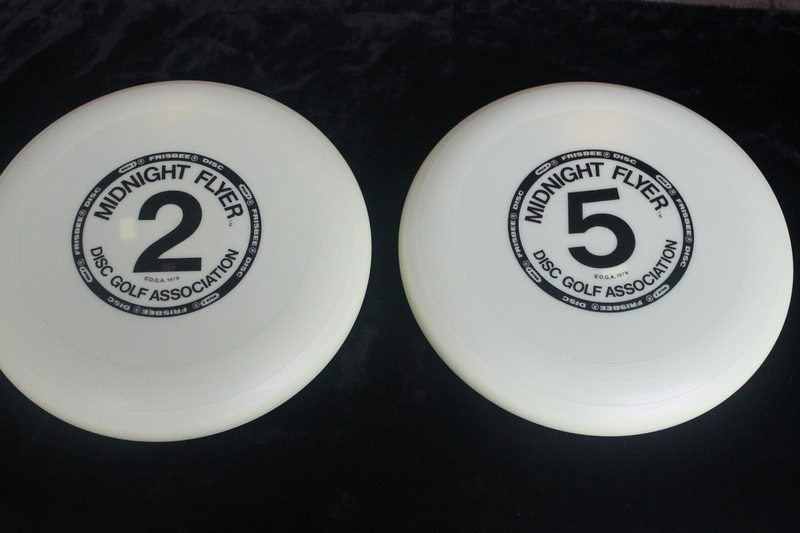 Wham-o 50 mold, Disc Golf Association Hot Stamp, unpigmented, does not glow. Value $80. This is now in the collection of Kevin Fuller. 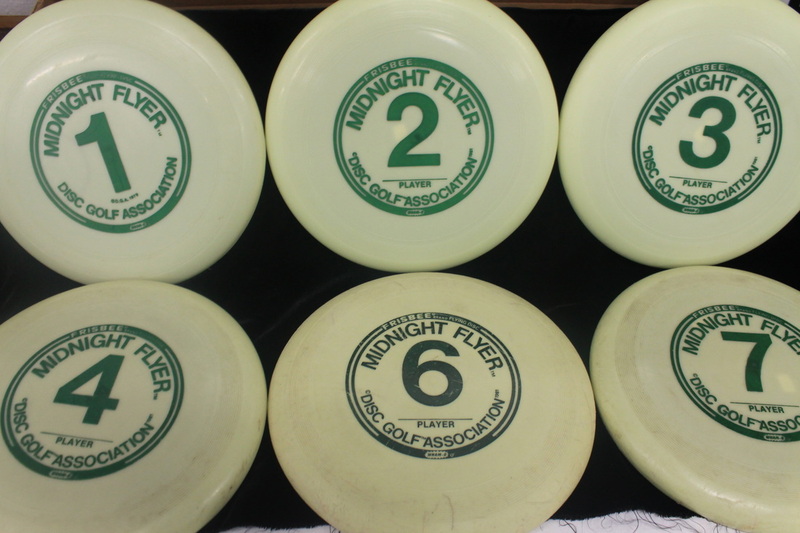 Wham-o 42 AG mold, Disc Golf Association Hot Stamp, slotted Trademark Band, Player line.These all have certs saying they are from Ed's collection, value $ 85 each. Wham-o 42 AG mold Disc Golf Association Hot Stamp, slotted Trademark Band, Player line. Value $75. Wham-o 41 G mold, Disc Golf Association light blue Hot Stamp, slotted Trademark Band with player line, Un thrown set. Value $700. 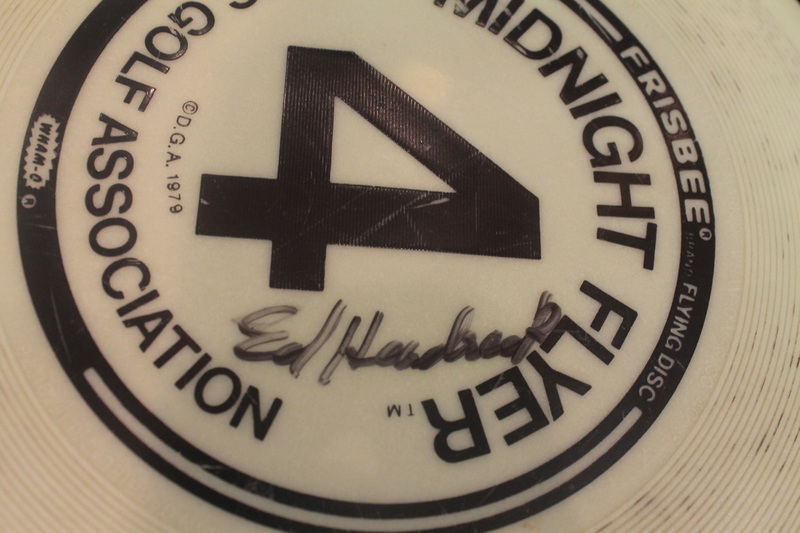 Wham-o 41 F, Disc Golf Association black trademark band, light use with ink on the underside. Value $350. Now in the collection of Braxton Paul. 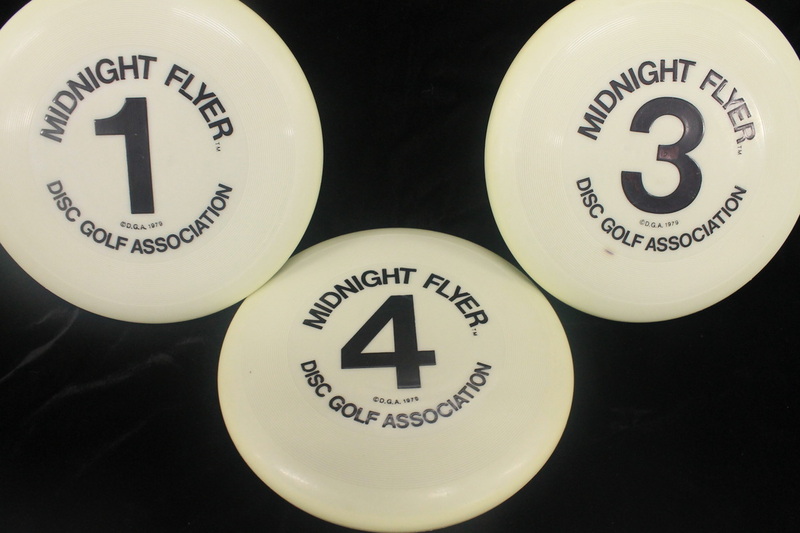 Wham-o 41 F mold, Disc Golf Association light blue Hot Stamp with slotted Trademark Band. #1 has a crack! little value there, on the right # 2 is new, Value $75. Wham-o 41 mold, Disc Golf Association Black Hot Stamp, No Trademark Band. Value $75 each. Wham-o 40 G mold, Disc Golf Association Green Hot Stamp, slotted Trademark Band, # 1 has no Player line. Mix bag on condition, $30-$75. Wham-o 40 F mold, Disc Golf Association Green Hot Stamp with a slotted Trademark Band. Un thrown set. Value $700. Had Ed sign this at the AM Worlds in Sacramento, of course my pen was a little worn out and did not make for the best autograph, I think that was 1994? 40F mold. Value $80. 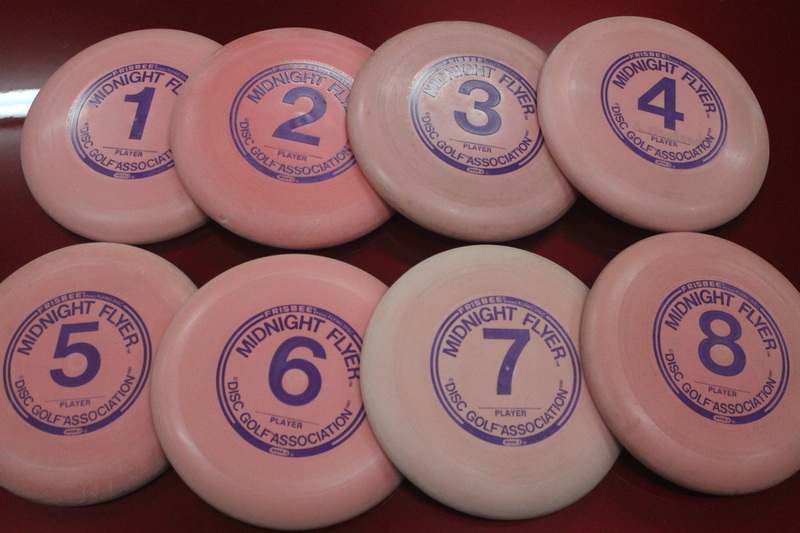 Wham-o 40F mold, Disc Golf Association Hot Stamp, Trademark Band. Notice the 2 different types of Trademark Bands, mix bag on condition, $35-$75. Wham-o 40 mold, Disc Golf Association Hot Stamp, No Trademark Band. Value $75 each. Wham-o 22B mold, Disc Golf Association Hot Stamp, Trademark Band. Value $75 each. Hard to tell in this picture but this 22A mold is not a glow. Wham-o 22A mold, Disc Golf Association Hot Stamp. Trademark Band.Value $75 each.